City approval of the Jefferson Park Station Area Master Plan may be on hold. The plan, which includes recommended design guidelines and transportation improvements for the area’s redevelopment, has been in the works for more than a year, and city officials had announced that the Chicago Plan Commission would hold a public hearing on the plan this summer. Concerns reportedly have been raised that the plan includes recommendations for private proprieties, but the city has adopted other master plans that include redevelopment guidelines for private land, including the Six Corners Master Plan in 2013. A property owner is not obligated to follow the recommendations, but the city could hold up a zoning request if a proposal would not fit in with the area’s development goals. During a recent meeting of the Jefferson Park Forward Community Development Committee, Alderman John Arena (45th) expressed concern that the city Department of Planning and Development may not adopt the plan, a resident at the meeting reported. Forward is sending a letter in support of the master plan to city officials. Staff from Arena’s office or the city planning department did not respond to requests for comment by press time. The city commissioned another master plan for Jefferson Park about 10 years ago, and the city never formally adopted that plan since the Plan Commission never voted on it. At the time there was community outcry over a recommendation calling for 1,600 new living units in and around the business district. The 2018 plan does not include zoning and density recommendations, and a copy of the plan is available at accessjeffpark.org. 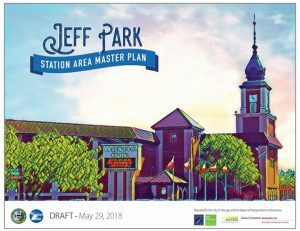 "The Jefferson Park Station Area Master Plan presents a vision and implementation plan for the future of the neighborhood, documenting the community’s preferred path for future change and providing predictability for potential new development. A comprehensive outreach strategy was undertaken to involve residents, businesses, neighborhood associations, cultural institutions, property owners and other stakeholders in a process to develop a vision, goals and projects for the area," the Web site states.